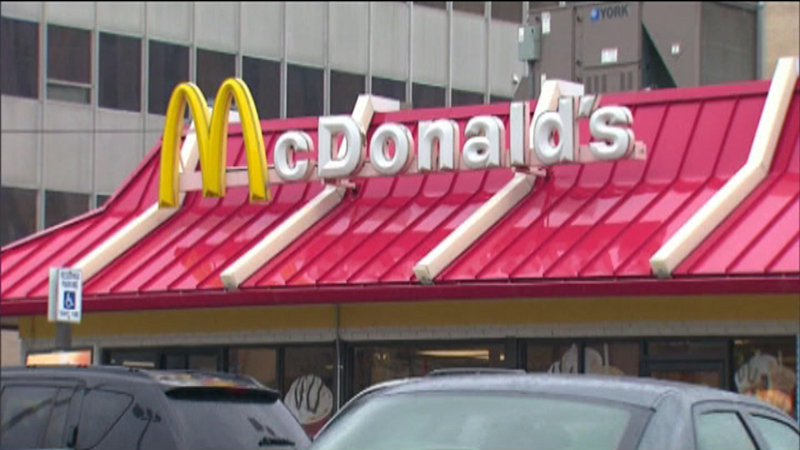 OAK BROOK, Ill. (WLS) -- McDonald's sales edged up at established U.S. locations during the third quarter, snapping a streak of about two years of quarterly declines. The world's largest burger chain also said sales rose 4 percent on a global basis at established locations. In the U.S., the figure rose 0.9 percent, marking the first increase since the third quarter of 2013. The bump was the result of a higher average check, however, which offset a decline in traffic. That means McDonald's still has a long way to go in fixing its business. The company said it expects the sales figure to rise globally for the final three months of the year as well, including in the U.S.
Its shares jumped sharply and struck an all-time high in early trading. McDonald's is making a number of changes in the U.S. that it hopes will set the stage for a turnaround. Tweaks to food preparation included toasting buns longer and searing burgers to make them juicier. For its Egg McMuffins, the company switched back to butter and regular English muffins, instead of margarine and whole grain muffins. A new buttermilk chicken sandwich, which is positioned as a premium offering, is supposed to boost perceptions about food quality - and help fetch a little more money. The company has also been simplifying its menu to speed up service and improve order accuracy. "Customers are noticing the differences," said CEO Steve Easterbrook, who took the helm in March. Easterbrook is presiding over bigger changes, too. Earlier this month, the company introduced "all-day breakfast" in the U.S., meaning people can get an Egg McMuffin whenever the craving strikes. Easterbrook was reluctant to give details on the early performance for all-day breakfast. But in his trips around the country, he said it seemed to be "cult-ish" among students. Richard Adams, a consultant for franchisees, noted the addition of all-day breakfast could complicate operations when stores are busy. And he questioned whether it would be a significant sales driver over the long-term. "The novelty will wear off quickly," said Adams. Other changes are in store, too. McDonald's is evaluating options to replace its Dollar Menu, which the company moved away from it amid rising costs for ingredients like beef. The company said it is working with franchisees to determine a new national value strategy. McDonald's needs to make up lost ground. In the year-ago period, sales declined 3.3 percent at established U.S. locations as customer visits dropped. Despite the sales bump and encouraging signs in the U.S., Easterbrook said Thursday that getting guest counts back up would be a "top priority." Easterbrook has said he wants to transform McDonald's into a "modern, progressive burger company." That has included a pay bump for workers at company-owned locations amid protests calling on McDonald's to give fast-food workers $15 an hour. McDonald's said its operating income dipped during the quarter as a result of its pay hike and other benefits, but that the move would pay off with better service. For 2015, the company is expected to reduce its store count in the U.S. for the first time since at least 1970, according to an Associated Press review of regulatory filings. That means culling underperforming locations to improve the health of its store base. The company, based in Oak Brook, Illinois, has more than 36,000 locations around the world. For quarter ended Sept. 30, the company said Australia and the United Kingdom delivered a strong performance. In China, where it was hit with supplier problems, McDonald's said its sales performance was "very strong." It earned $1.31 billion, or $1.40 per share, for the period. That topped the $1.27 per share analysts expected. Revenue was $6.62 billion, also above the $6.41 Wall Street expected, according to FactSet. Shares closed up 8 percent at $110.87.